It seems the recent release of book 4 on the tails of the promo for book 1 was a very good idea. Not only has book 1 been #1 in FREE Christian fantasy since then, but books 2 & 3 have been in the top 10 in that category, paid, as well. But I was totally amazed by what we found out today. 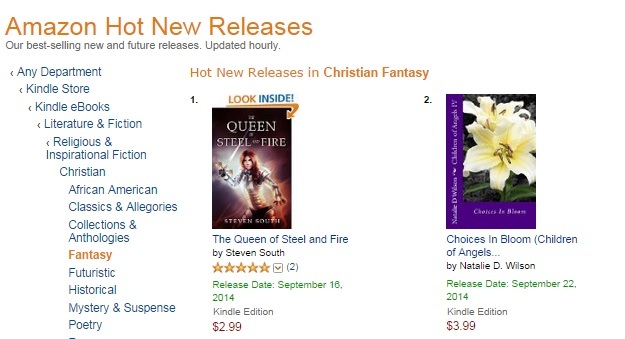 Book 4 is #2 on the Amazon ‘Hot New Releases in Christian Fantasy’ list. Wow! Thanks to everyone who has read, reviewed, and/or shared the news of my series. I feel so happy and blessed. I also want to let everyone know that we have now made it into all of the e-book stores except for Nook and expect it to show up there very soon. Also, I hope to set up Book 5 for pre-sale before too long with a planned release around the first of February. No spoilers here, but the title of Book 5 is Rohan’s Choice. I know all of my Rohan fans out there will be excited to hear this. After a LONG wait, (trust me, Will and I have been busy trying to bring you the best book possible), Children of Angels, Book 4, CHOICES IN BLOOM is finally available in PRINT. It’s not showing up through regular search methods yet, but you may get it from Amazon here. You may also get it, just like the other books from my Createspace store with a 25% off coupon code. See BOOKS above and scroll down for the purchase link(s) as well as the discount code. (Same code for all books). In other exciting news about print versions, we have done some minor editing and revision to the first 2 books as well as a reformat of the first 3 books to bring the print price down slightly. Cratespace store discount codes are now 25% off the NEW LOWER PRICES! UPDATE 1: The Kindle Version is now available on Amazon. All of the links and connections are not squared away yet, but you can find it by searching, or from the BOOKS link above. Otherwise, the e-book is only available through Smashwords at the moment, but we expect it to begin showing up on other e-book stores VERY SOON. I am so excited to share my Children of Angels series with as many people as possible. That is why, starting today, the first book in the Immortal Reborn trilogy is FREE for ALL e-book platforms. No matter which e-reader you read on, you can get a copy of Arianna’s Choice for FREE. You can find it by searching for my name in each reader’s respective store, or to make it easier for you, you may refer to the BOOKS tab above for quick and easy links to the book in each store. I plan to keep this promotion in place until the upcoming release of Book 4 in the series and possibly beyond. If you haven’t begun reading the series, what better time to start? If you have read it, this is a great time to recommend it to your friends and relatives! For those who don’t know me well, I am a big fan of the BBC show Doctor Who. Will decided to make this a VERY Doctor Who Christmas. The center image is from a Doctor Who 50th anniversary t-shirt. 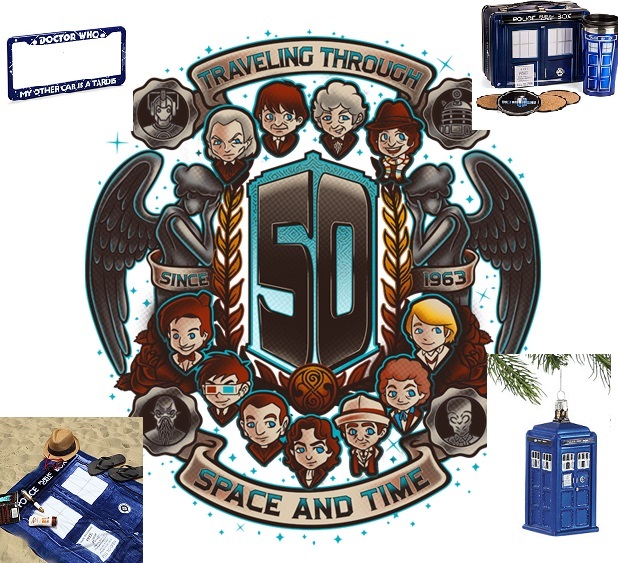 Around the outside are images of a license plate frame (My Other Car Is A Tardis), a Tardis Christmas Ornament, a Tardis lunchbox kit including coasters and an insulated cup and a Tardis beach towel. I love them all! Please remember the currently reduced prices on my ebooks. They are good until the end of the year. If you got a new e-book reader or tablet, you can read the entire currently released IMMORTAL REBORN trilogy in my CHILDREN OF ANGELS series for under $4.00. Don’t miss out! And remember, if you’ve previously purchased a print copy from Amazon, you can get the e-book for free right now as well. I’m currently working to get Book #4 (my problem child) ready for you and once it is out, Books #5-#8 are already waiting. I just found out about a NEW feature that Amazon will be rolling out in the coming weeks (October?). It’s called Kindle MatchBook and I’m very excited about it both as a reader and an author. The way it works is, for select print books purchased as far back as 1995 from Amazon, you will be able to (if the authors/publishers choose to enroll) purchase a Kindle copy for a greatly reduced price. Some may even be FREE depending on the original book price and publisher choice. I have just enrolled all 3 of my current books so that anyone who has purchased a print copy from Amazon will be able to get the Kindle version for just 99 cents. It has already occurred to me that some of you may have purchased my print books elsewhere and I plan to make every effort to extend this to you as well. Even if you have an e-reader other than a Kindle, I have plans to make a similar offer available. Stay tuned for more info. You can read the e-book many ways. It’s available for all e-readers, iPad, iPhone, etc. If you would like to read it and are not sure how to do it on your device, email me at nataliedw2 @ gmail.com or message me on facebook. Will and I will do our best to help you get started reading my series.